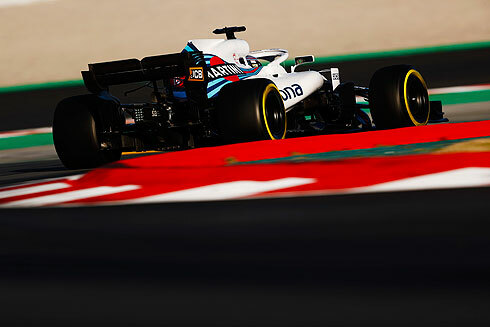 The Williams Martini team would return to the Barcelona circuit for the first day of testing in what is the last opportunity to do so before Australia. The team would run both Sergey Sirotkin and Lance Stroll during the day. Sergey would have a few minor issues that would affect his time on the track while Lance would complete a full race simulation which also saw him complete a run on the hypersoft tyre. Overall a productive day for the Williams team as they continued to put miles on the new FW41. Start of the final week of testing would see Sergey Sirotkin out first for Williams in the morning session. His first run would be on soft tyres pitting after his installation lap. The fastest times et so far in testing has been a 1m:19.33 set on the medium tyre. 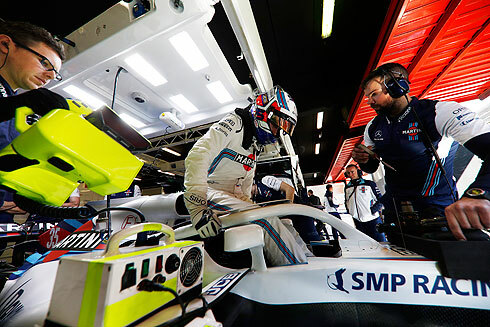 It was noticeable that the SNMP Racing logo was somewhat bigger on the FW41 than that run in the first week of testing. Sergey would pit having now completed twenty laps. Sergey would come out for another run still on the soft tyre and would improve with a 1m:21.588 to now be 0.99 behind the quickest time. On his lap Sergey had gone quickest in the first sector. He had now completed twenty nine laps. Quickest time was lowered with a 1m:20.396 seeing Sergey now 1.1 seconds behind. Sergey would return for a short run still on the soft tyre. He would pit now having completed thirty two laps. Sergey would complete another run just prior to lunch seeing him finish his run having completed forty two laps without improving his lap time. The afternoon session would see Lance Stroll take over from Sergey. His first run would see him set a 1m:25.214 running on the soft tyre. He would complete a longer run of seventeen laps prior to pitting. With two hours remaining in the day Lance still had only complete his first run. But he would return still using the soft tyre for his second run but it would be a short one of just six laps seeing him complete twenty three laps. The afternoon would continue with Lance continuing his runs. One of those would include a run on the hypersofts that would see him set a 1m:22.937. But the majority of his time was on the soft tyre with Lance completing a full race simulation. Lance would finish the day slowest. Paddy Lowe, Chief Technical Officer: It’s great to come here to some more normal weather in the second week of testing. We were running Sergey in the morning and Lance in the afternoon. Sergey had a bit of a slow start because we had a small problem with a bit of bodywork which lost us an hour to change some parts. Sergey managed some reasonable runs but with the warmer temperature, it’s a bit windier this week so we had some tricky balance issues which we were not able to address during the morning session. Lance took the car in the afternoon with the objective to complete a race distance, which he did, taking it right to the flag. Lance’s long run also included our first look at the hypersoft tyre. At the end, we also completed the FIA restart tests. In summary, we’re very happy to cover a lot of laps today, including our first race distance with the FW41 without incident. Sergey Sirotkin: We had warmer temperatures today but they were tricky conditions. It looked like a nice day but it was not so easy testing-wise. We had a couple of little issues throughout the morning so it was not ideal, but for sure it was still better than last week and I still learnt something from it. We also got some data which will help us tomorrow with the stuff we’re doing. Today was not ideal, but it is how it is. Lance Stroll: It was just good to do some kilometres in the car. I have the first race distance of the year under my belt now and it was positive. I believe we have made a step forward compared to where we were last year with just the general feeling and grip level. I don't know where we will be compared to everyone else, but compared to last year's car, it definitely feels quite a bit better. So far, so good and we just need more seat time, quali sims, race sims and I believe we will be in a good place when we get our programme done and are heading into Melbourne. I believe we can still improve a little bit everywhere. There is still so much we haven't tried on the car yet. In a Formula One car you have so many set ups and it takes two weeks to get everything out of the way. I believe there are still little things we can do and again, it was a race sim so I can't compare that to what we were doing last week on lower fuel. There is still a lot to learn but race simulation-wise, I believe we are in a good place. But also, definitely these conditions are not ideal, as this smooth surface in Barcelona doesn't give much graining to the tyres, so I am sure it will be very different when we show up in Australia. 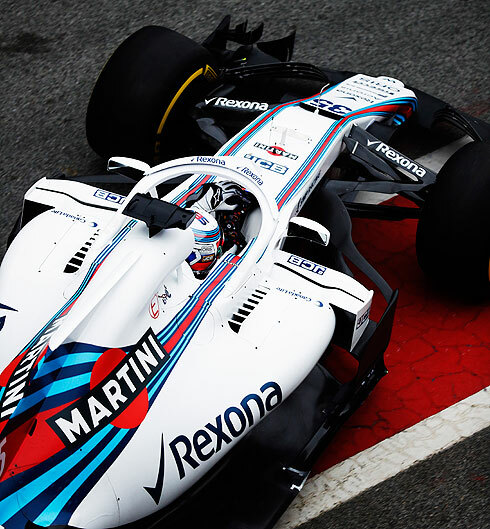 The FW41 returns to the track tomorrow with Lance driving in the morning session, before handing over to Sergey in the afternoon. Edited 1 time(s). Last edit at 2018:03:07:02:33:25 by Mr Brooksy.